Arcona Property Fund, listed on the Amsterdam Stock Exchange, announces the successful closing of the sale last week of one of the properties in its Prague portfolio. 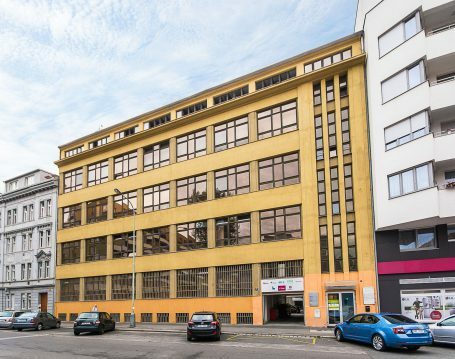 The buyer of the functionalist administrative building on Drahobejlova Street in Prague 9 is the Czech Medical Chamber (ČLK), which has long been looking for a new building for its Prague representative office. 2,500 square metres of space for lease over five floors as well as nine parking spaces. The property offers good transport links and amenities: O2 Arena and shopping mall Galerie Harfa are located within a two-minute walk. The entire area has been undergoing a renaissance over the past few years, becoming an increasingly attractive location for businesses and residents due to its proximity to the city centre. MUDr. Milan Kubek, President of the Czech Medical Chamber, added: “We will establish our new representative office in the purchased property. It will be called ‘House of Doctors’ and serve not only as a training and conference centre for the Chamber, but also as a meeting place for all doctors working in the Czech Republic. The ČLK will thereby continue the tradition of the Chamber of Physicians of the Kingdom of Bohemia founded in 1893.” The ČLK is an independent, non-political professional association that represents physicians working in the Czech Republic, with currently 52,000 members.